In an effort to save money, I have started making more than just food. One of the consumables that was costing us the most each month was baby wipes. So I researched recipes for baby wipes. The most common recipe I saw had 2 parts baby soap to 1 part baby oil. One person advocated no baby soap, as leaving it on the skin may irritate the tender sweet tush of your baby. 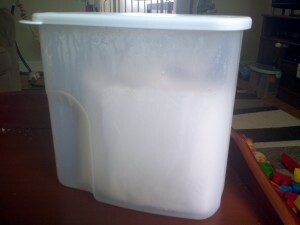 After some thought, I decided a little soap was important, it would help cut through the messier diapers. Although I was still concerned about irritating little tushies, so I lessened the about of soap in the recipe. Further, I determined I would use an organic soap in it. The organic soap lessens the extra chemicals that are finding their way into the wipes. Bring 2 cups of water to a boil. While the water comes to a boil, use the knife and the cutting board to cut the roll of paper towel in half. You will need to cut the tube out of the center of the paper towel roll. Place your paper towel in your container. Once the water has come to a boil, turn the heat off. 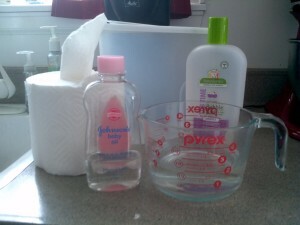 Measure and mix into the water your baby wash and oil. Let the water mixture cool some, and then pour over the paper towel. Put the lid on the wipes. Don’t worry if the water has not perfectly over the paper towel. The water will eventually spread to cover all the sheets. I also recommend pulling the wipes from the center of the roll. This entry was posted in Homemade, Recipes and tagged baby, Recipe, wipes on July 4, 2013 by Sara R.